Is everything we do made from pallets? This is a question we are often asked an markets, craft fayres and other events. We do use a lot of pallets of course, hence the name, Pallet Earth. We recently calculated we are saving 120 pallets per week from incinerators or landfill! However, we are about saving any timber from being dumped, burned or otherwise scrapped if it can serve another purpose. Last year, we even collected a 20 foot long packing crate of Canadian Pine, which has since been used in many products. We knew this had carried a dynamo from South Africa to Gateshead. When we discovered a Portuguese stamp showing it had in fact been constructed in Europe, we began to realise the mileage this North American timber had completed. I was sure to pass on this information to the Australian couple at Tynemouth Market, who bought two off-cuts that we'd made into serving trays to take home to Sydney! More recently we have been finding new uses for cable reels. Due to the strain they are under carrying a full load of cable, these often can't be used more than once and they are somewhat large to dispose of. Sometimes we have to adjust them or tighten them up and usually there's a lot of work cleaning them up. Once that's done however they make very sturdy tables and look impressive in a café or on a patio at home. Take a look at what we can make of these here. Old fencing, decking, barrel slats, scaffolding boards, display stands, joists and other construction timber can all be found a new life if at least part of it is intact enough. We have used all of those over the last 18 months. As well as being a natural substance, wood is the most versatile material to make things out of so it's also one of the best things to recycle and reuse. 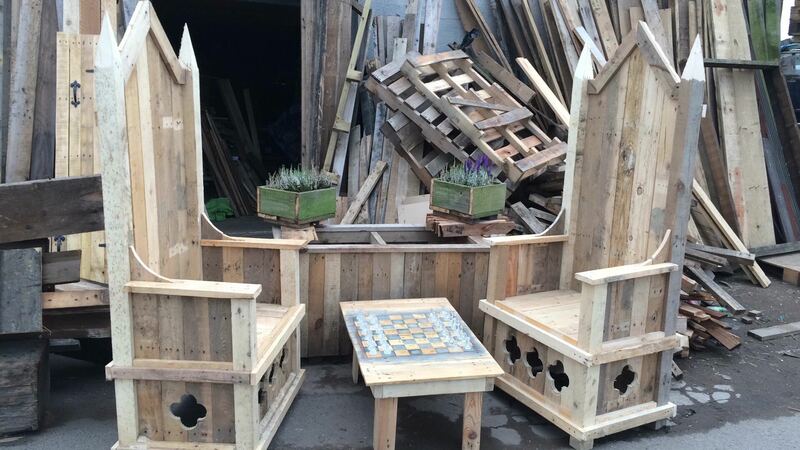 So, yes, pallets are a key part of what we do, but if there's wood going to waste, and we can use it, we will.